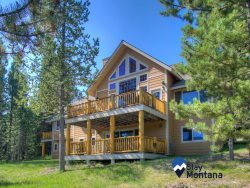 This fully furnished 2 bedroom house is perfect for your longer vacation to Bozeman! With downtown Bozeman only a few blocks away, you will have access to local shopping, theater, art galleries, restaurants and much more. The home is also located very close to the Montana State University. So whether you are in town for an event or just taking a family vacation, Backyard Retreat is your perfect home away from home! Our well appointed retreat is complete with an updated kitchen, hardwood floors, and large deck in backyard oasis.